What happens to your Blackboard course when its course reference number is changed? You may know your course by its module code e.g. However in the University Student Record System “Banner” an additional Course Reference Number (CRN) is used. CRNs are used to differentiate the same module which has more than one delivery in an academic year. For example one module may be taught to separate cohorts in semester 1 and semester 2. Whilst the module code is the same, each delivery will have its own CRN. How does Blackboard use CRNs? For every module and CRN in Banner there is a corresponding Blackboard course. This helps instructors who have a module being delivered twice in the same academic year (such as in the above example) to keep their cohorts and their assignments separate. You can see how the course code and course name are populated by looking at our naming conventions. What happens to my Blackboard course if the CRN of my module is changed? A new Blackboard course will be created linked to the new CRN. As with all new courses it will be empty and unavailable to students. Any instructor, teaching assistant, or student who had been added to the original course will lose their access to it. Any instructor, teaching assistant, or student who is set to be authorised to access the new CRN in Banner will be populated onto the new Blackboard course for that CRN. It will appear to students that their course has been made unavailable. It is not reasonable to expect students to see that the CRN has changed. They will not be able to access their learning resources, submit assignments, or otherwise interact with the module’s Blackboard presence. It will appear to instructors and teaching assistants that their course has been wiped, all content lost, and been set to be unavailable. It is reasonable to expect that teaching staff will have been informed of the change by their Faculty and so will spot that the CRN has changed. All material and student data remains on the original course. Before changing CRNs of modules that are currently running, the faculty should make contact with the Blackboard administrators in iSolutions via ServiceLine. The faculty should tell all staff involved with teaching the course of what is about to happen to their course. A mitigation plan should be determined between the Blackboard administrators, course instructors, and faculty office. This can then be planned for implementation once the CRN change has been made in Banner in order to prevent students and staff suffering any outage in their online course activities. 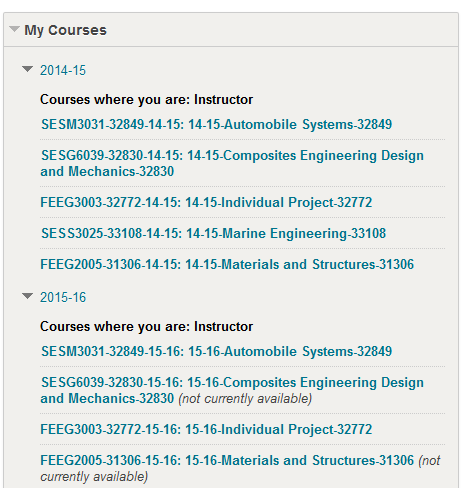 You can check on which courses you are an instructor by viewing the My Courses box when you log into Blackboard. The My Courses box shows your Blackboard courses with details of the module code. The academic year for which the course applies is at the beginning of the course title. To understand what the codes in a Blackboard Course ID mean please read Naming conventions for Blackboard courses. Courses are set to be unavailable at creation. 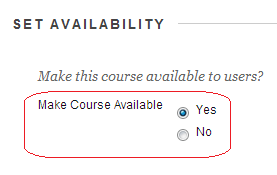 This means that the courses are unavailable to users until you make the course available. What “Banner” courses are automatically set up on Blackboard? Each course module held in Banner has a Blackboard equivalent. Only course modules with a subject code and course number are created, e.g. SPRT1003, MANG2005, SOES6039. Any instructor who is listed in Banner as an instructor for the module will automatically be made a Blackboard instructor for the equivalent Blackboard course. Naming conventions for Blackboard courses. Programmes are not created, only modules. “Arbitrary Courses” may be set up to support other uses of Blackboard. To find out more check the “Arbitrary Course” Application Form. Students are registered automatically onto Banner courses. Where registration information is available in Banner for a course, it will be carried over once every 24 hours into Blackboard, on week days enrolment information is updated three times a day. If a student is dropped from a module in Banner their record will be disabled within the Blackboard course, but they will not be deleted from that Blackboard course. This means that although they cannot access the Blackboard course, any discussion board postings, Gradebook entries and other student-related data will be maintained. This may be useful for QA purposes. So called “Arbitrary” Courses should use self-enrolment. In order to know which courses staff should have access to Blackboard takes its instructor information from the Banner student record system. Any member of staff listed as an instructor for a course in Banner will automatically be made an instructor on the Blackboard version of the course. This information is provided by faculties themselves. Being assigned the above role to a module in Banner will result in receiving instructor privileges in the corresponding Blackboard course. Being assigned the above role to a module in Banner will result in receiving teaching assistant privileges in the corresponding Blackboard course. Where a member of staff has multiple roles on a module in Banner, Blackboard will use the highest of those roles. Academic Liaison Librarians continue to receive the teaching assistant role. Adding and removing staff can be arranged by contacting the Curriculum and Timetabling Team in Registry. Changing the role of staff who are already assigned to modules in Banner can be arranged by contacting Student Records in Registry. Only if the above methods are unsuitable should staff or students be added manually to a course. Check our Blackboard user management pages for guidance. Blackboard receive updates from Banner each day. So if an instructor is added to a module at 11:00 on a week day they will see the module on Blackboard by 12:21 the same day. If an instructor is added to a module at 11:40 they will see the module in Blackboard from 17:21 on the same day. Students enrolments are only removed from Blackboard on Sunday mornings. This is because in Banner the “CompReg” process means that when certain details of a student’s enrolment record are changed they may be removed from modules and then added to new modules that following day. These changes are sometimes made as a result of a mistake. Depending on when the changes are made it is possible that students could experience a loss of access to a module for several days. In an attempt to alleviate these issues, when students are dropped from a module in Banner this will only take place on Sundays, to give any automated processes or mistake rectifications to take place during the week. Each course has a Course Reference Number (CRN). The CRN is used to differentiate the delivery of a course by time (e.g. semester, or daytime class and evening class) or space (campus, location). The Course Reference Number is appended to the Blackboard course title. This is useful if your course has several deliveries. You then have a Blackboard course for each delivery of the course. The enrolment information taken from Banner will automatically enrol your students onto the correct delivery of the course. If you wish to use only one of the courses for all students, it can be arranged so that students on one CRN are “mapped” to the CRN you wish to use. This means that whilst the instructor will see all CRNs if you request students on CRN12345 and mapped to CRN67890 then students on CRN12345 will only see CRN67890 on Blackboard. Instructors will continue to see both CRNs because the mapping only applies to students. This can be requested via a ServiceLine ticket. If any instructor records for courses are missing from the list of courses you are teaching please contact the Curriculum and Timetabling Team (curriculum@southampton.ac.uk / x23506) and ask that they update Banner with the corrected information. You will need to provide your staff ID number. Once the changes have been actioned in Banner Blackboard will be updated within 24 hours. Course titles are also taken from Banner, if you find an error in the title of your Blackboard course please ask your faculty administrator to correct the course title in Banner. Any changes will be reflected in Blackboard the following day. There are three ways to make your “Banner” course available to students. All achieve the same outcome, using different methods.